I am told it is called a 'vacation,' but it flies in the face of everything I thought I knew about vacationing. When the husband announced that he, too, was taking time off this week, and then insisted that I rearrange MY time off so that they overlapped, I was all, "How sweet! He wants to help me work on the back-back-back 40 yards!" But then he's all, "Where is your swimsuit?" and "do we have a duffel bag around here anywhere" and "go get some cash, we'll need it for the drive" and I'm all, "Oh! Are we going to the GOOD feed store? OH. MY. GOSH!!!!!! !, you're getting me my chickens, aren't you?! I LOVE YOU SO MUCH HONEY, YOU'RE THE BEST!" And he gave me this REALLY patient look and said something like, "Oh, HELL to the no. Get in the car." And now, we are here. 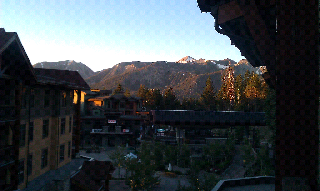 Mammoth Lakes, CA. We're staying in a nifty "condo" (read: exceptionally nice hotel room with more than the average amenities - like a full kitchen, fireplace (off now for summer) and guess where the Denizens are?! At home with their Wonder Nanny. Aaaaanyway, I'm just saying that it would be more sensible and prudent if OOOOOOOOO, GONDOLA TO SUMMIT, HIKE BACK DOWN?!?! YESSSSSSSSSSSS, LEMME TIGHTEN UP MY LACES....ahrm! I'll have to get back to you guys on that whole 'why this isn't a particularly good use of our time and resources' thing. Glad you got away -- you could use a break. Enjoy! Good on you - time to get away and remember how you ended up with the Denizens. Sweet! Have a WONDERFUL time, you deserve every minute! Anyway, have fun! The back 40 will be there waiting for you when you get home.